The Pousette-Dart Band, led by Jon Pousette-Dart carved a place in the landscape of American music in the 1970 s, and became one of the busiest touring groups in the US working with The Byrds, Bonnie Raitt, Little Feat, The Eagles, James Taylor, Manfred Mann, Mahavishnu Orchestra, Emmylou Harris, Robert Palmer, Randy Newman, Journey, Billy Joel, the now famous Frampton Comes Alive tour, etc. playing arenas from coast to coast. Jon now has 9 albums 2011 s Anti Gravity features the current band, and songs written with Angelo (Kings of Leon), Darrell Scott (Robert Plant), Gary Nicholson (Buddy Guy), and co-producer Jim Chapdelaine. 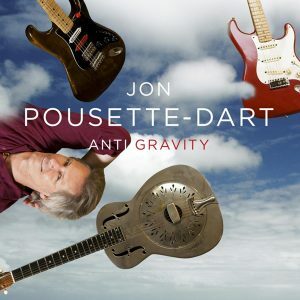 Anti Gravity marks another major milestone in Jon Pousette-Dart’s remarkable career… graced by instantly engaging melodies that aptly define the many facets of his expressive outreach. No Depression a gilded tenor and a smooth hand on the guitar…confident, not arrogant. P-D s maintained a loyal following throughout the years, still tours regularly…and has plenty of fuel in the tank. Mix Magazine Anti-Gravity ranks with Pousette-Dart s best efforts … A melodic, cohesive collection of tunes which will no doubt satisfy longtime followers while attracting new fans. Vintage Guitar Magazine The missing link between The Byrds and Vince Gill, a folk rock legend.